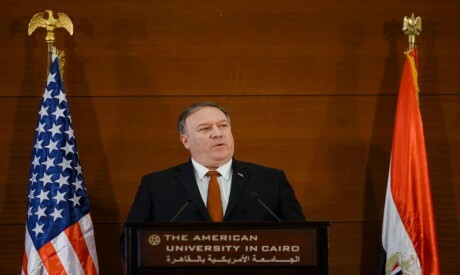 Palestinian officials and analysts say that US Secretary of State Mike Pompeo sent a variety of messages during his address at the American University in Cairo as part of his Middle East tour last week. Most notably, there was a reshuffling of issues for the US in the Middle East and the propagating of the Iranian threat as a top priority in the region at the expense of the Palestinian cause, a ploy to minimise the importance of the issue and indirectly support the US’s traditional ally Israel. These US moves come at a time when the region is facing significant challenges, most prominently the political freeze of the Peace Process between the Palestinians and Israelis, disputes with Iran, the Gulf crisis, the threats of terrorism and the proposed Middle East Strategic Alliance (MESA) suggested by the US. Mustafa Al-Barghouti, secretary-general of the National Palestinian Initiative, said that Pompeo’s address was “insolent and ignorant of history” and that it contradicted the speech given by former US president Barack Obama in Cairo nine years ago. He said that the positions declared by Pompeo, especially his stance on the Arabs, Muslims and Palestinians, were peppered with falsehoods and ignorance. They demonstrated the inability of the incumbent US administration to handle the current situation in the Middle East, he said. Al-Barghouti said that Washington’s focus on the Iranian issue aimed to fracture the region, divide the Arab world, and decimate the Middle East in order to allow Israel to circumvent the boycott it is facing. The aim was to allow the normalisation of relations with Israel under the pretext of confronting the same enemy, Iran. “This, of course, is contrary to reality, reason, and the interests of the Arab people, and it should not be allowed to happen,” Al-Barghouti said. Palestinian political analyst Abdel-Majid Sweilam said that the intentional disregard of the Palestinian cause by the US revealed a crisis in Washington and a hostility to the Palestinian people. It was also proof that the Palestinian cause was foundational, he said, because the focus on secondary issues at the expense of the main one meant that the larger strategy was falling apart. “This explains why the Americans are ignoring the Palestinian cause,” he said. Sweilam said that the so-called “deal of the century” to be put forward by the US on Palestine was failing because the Palestinian people would not agree to it. “The US knows that it cannot have an effective policy in the Middle East without acknowledging the rights of the Palestinian people,” he stressed, adding that the Israelis would not recognise the Palestinian people or their rights. “The main goal of the ‘deal of the century’ is to erase these rights,” he said. Sweilam said that US intentions could not change reality and that the Palestinian cause would continue to be the foundation of stability and security in the region. He added that the US administration was “detached from reality” and wanted to create a reality for itself. Nabil Shaath, Palestinian presidential adviser on foreign affairs and international relations, said the “deal of the century” has nothing to say to the Palestinian people, since the US was only interested in dominating the region and confronting Iran. This proved that Washington was weak, he said, and was further evidence of its diminished power and importance in the world. For decades, US diplomats have viewed themselves as mediators between the Palestinians and Israelis, and US secretaries of state have usually met with Palestinian representatives during regional tours. However, relations between the two sides deteriorated a year ago after US President Donald Trump decided to relocate the US embassy in Israel to Jerusalem and recognised the city as the capital of the country. He also shut down the offices of the Palestine Liberation Organisation (PLO) in Washington and suspended US funding to the UN Palestinian refugee agency UNRWA. Pompeo’s visit to the region came amid peaceful protests since March 2018 along the border between Gaza and Israel, resulting in the deaths of more than 255 Palestinians and the injury of thousands. Aaron David Miller, a former US mediator to the Middle East, said that Pompeo’s indifference to the Palestinians implied an unofficial disregard for “the Palestinian-Israeli explosion” and demonstrated Washington’s impotence in impacting events. “Instead of discussing the Palestinian cause, Pompeo’s visit focused on Iran and an agreement that Tehran is a destabilising force,” he said. Last week, Pompeo arrived in Cairo after a brief and unannounced visit to Iraq aiming to reassure Washington’s allies about US support in the war against the Islamic State (IS) group, despite the US announcement that it would withdraw its troops from Syria. The trip also coincided with the resignation of retired general Jim Mattis as secretary of defence and retired general John Kelly as White House chief of staff. Mattis and Kelly were two key figures thought able to tame Trump’s policies, and there are now no senior retired military figures in the US administration. Trump’s foreign policy continues to raise many questions, especially his military strategy. Mattis resigned last month after Trump suddenly announced that the US would withdraw its troops from Syria, and this was followed by leaked reports that Trump intended to withdraw thousands of US troops from Afghanistan.